Just like you would never write, or say, ma amie (feminine) – even if “my” friend was a girl or woman, because it would sound like ma’amie, which reads like Finnish, and if spoken (go ahead, try it) sounds like bleating sheep. So it’s always mon ami, and mon amie, a gender-bending (and for us learning the language, a mind-boggling) minefield of a mix of masculine and feminine pronouns. Another thing that confuses people is salade, which is what lettuce is generally referred to in French, when talking about the genre of lettuces. If it is a specific kind of lettuce – batavia, rougette, romaine, l’iceberg, etc, it’s often referred to by type. Yet the word salade is also used to refer to composed salads, like salade niçoise, salade de chèvre chaud, and salade parisienne. Hence non-French speakers are often confused when they order a sandwich with salade and find a few dinky leaves of lettuce on their plate, not the big mound of nicely dressed greens that they were hoping for. Whew! After those first three paragraphs, I think you’ll understand why French is a tricky language to master, and even the French are at odds with how to say and write what. No wonder everybody smokes. #stress In fact, I think I also need to step outside myself after writing all of that. Flan is another word that is a bit confounding to visitors, especially for those of us familiar with Mexican flan, which is called crème renversée or crème caramel, in French. In pastry shops, visitors to France are often surprised to see wedges of dense custard-filled tarts, sold as flans. They’re a popular snack in the afternoon, although I can’t say I’ve had one that I truly love. It’s a very easy dessert to make and I was happy when I got Patisserie Made Simple by baker Edd Kimber, a book filled with recipes for French pastries, simplified for all. (Now if he could only do that for French!) And each pastry looks beautiful, too. In it, Edd has a recipe for Far breton, which had me reaching for my Armagnac bottle to get those prunes soaking. I played around with the recipe a few times, trying more prunes (the picture of the prunes in the baking dish shows fewer prunes than I ended up using in the recipe below), and even giving a go at a gluten-free version using 1/2 cup (70g) corn starch, which resulted in a bubbling dish of prune-dotted butterfat during baking. I dialed up the Armagnac (*yes! *), tinkered with the sugar, and went back to using regular flour. After I popped the final one in the oven, I then made myself un une salade for lunch…not just a leaf, but a whole bowlful. And wished myself Bonne appétit. Or rather, make that, Bon appétit. 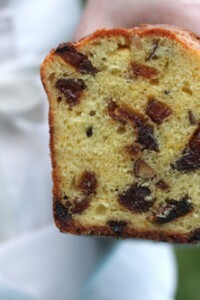 Inspired by Patisserie Made Simple by Edd KimberAlthough I’ve seen versions of Far breton made with raisins, I urge you to resist the urge to substitute another dried fruit. Prunes really make this dish. To pit prunes, use a paring knife to make a slit in each prune and slide out the pit. For those who really don’t want to use prunes, I’ve seen French recipes that use raisins, so those are entirely permissible. 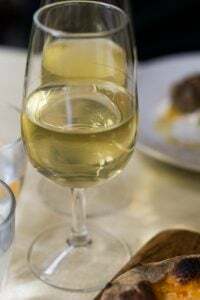 If you are avoiding alcohol, you could poach some prunes in tea and use those, drained.The batter is similar to crêpe batter, and like crêpe batter, it should rest for at least 4 hours in the refrigerator before using it. You can make it the day before you plan to use it. If you prefer a less-sweet dessert, you can reduce to sugar to 6 tablespoons (75g).Some recipes advise lining the baking dish with parchment paper, which I found wasn’t critical. And in fact, it got soggy during cooking (and tore easily) – so decided to stick with regular butter and flour, and didn’t have much of a problem getting pieces out of the baking dish. 2. To make the custard, put the milk, eggs, yolks, sugar, melted butter, vanilla, salt, and flour in a blender. Blend until smooth. Refrigerate the custard for at least four hours, or overnight. 3. To bake the Far breton, preheat the oven to 400ºF (200ºC). 4. Generously butter the bottom and sides of a baking dish roughly 10-inches (25-30cm) in length. (Or use a round cake pan of similar diameter, but not a springform pan, which would leak.) Dust with flour and tap out the excess. Strew the prunes in the bottom of the baking dish. 5. 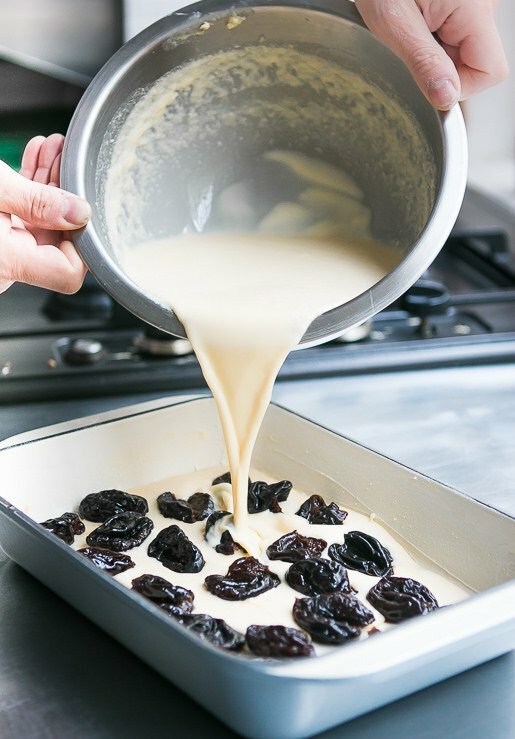 Stir the chilled custard a few times, then pour it over the prunes and bake until the top is gently browned, 45 to 50 minutes. Let cool completely, then slice into bars. Storage: Far breton can be made up to three days before serving, and refrigerated. Let come to room temperature before serving. Firt time posting . Just found your blog yesterday. Was looking for how to make a Kouign Amann and found your blog. So I look forward to trying to make one. Also today the Far Breton looks so lovely too. David may I ask when you bake these two cakes where do you place them in the oven? This always confuses me. The middle, or lower part of the oven. I would be so grateful if you could help me there with knowing that. As a french person, I do find it a bit odd that you didn’t mention liasions in your post about errors. Bon anniversaire is not pronounced bonne anniversaire, it’s simply the connection between the last consenant and the first vowel. If it’s any conselation, I have been learning english for 10 years as an adult and recently learned I will never be even close to perfect, so I’m over it now and just say whatever I want. It’s all about les phonétiques anyway David !! For me,the most important part, is the love of sharing the passion of baking,and cooking or we wouldn’t be here, and having the chance to speak and see what David makes and bakes, is all I need to be a happy baker. Thanking you for sharing what you know, and took time to learn. I have recently discovered your website and am enjoying it immensely. And I have all your previous posts yet to explore. You do great work and your photography makes my day. Truly. A minor note: I think you left out of your custard the 2/3 cup flour in the Far Breton instructions. You do mention dusting the buttered baking dish with flour, but I expect you don’t mean with 2/3 cup. But, again, thank you for your dedication to this wonderful blog. Loved your musings about the language. My first language is Portuguese, so I had a leg up on learning French, since both languages lack the neutral pronoun. Of course there are reversals – in Portuguese the sea is male (o mar), in French it’s female (la mer). As Carla pointed out, the trouble is with the connections. On the other hand I miss the neutral pronoun in Portuguese. It’s nice to say “I am going out with a friend” and leave the gender of the friend a mystery. 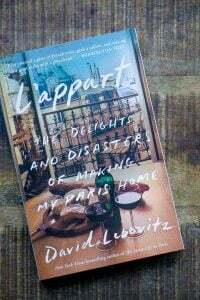 I have to confess that I read your blog mostly for the French life tidbits than for the recipes. gendered language sure is hell to learn when your first language is English. I’m living in Germany learning Deutsch and it’s very difficult…. I feel that if you really want to make the cake,or what is being baked then,regardless of what country you live in just follow the weights what is given in the recipe,heat of the oven,time,and Voila. Enjoy! Happy baking one and all. patricia: All ovens heat very differently but I bake this in the upper third of the oven. Leticia: It’s funny because when you’re not learning a language, you tend not to think about things like this. But when you are, they’re all-important. I always thought that English was hard but my French friends say (well, most of them) that it’s easier because there are no masculine/feminine pronouns, and we have a lot fewer verb tenses. 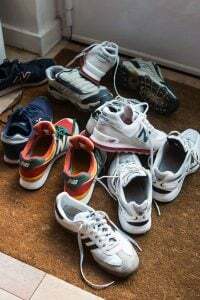 But I know people have trouble with things like wear/where/ware, and its/it’s, as well as they’re/their/there, and things like that. Will: Thanks – got it! Carla: I was going to mention liaisons, but after three paragraphs, I figured readers would be wondering when I’d be getting to the recipe! One could write a whole book about the French language – and people have – due to the subtleties and nuances found in it. Traditio,or chaleur tournante,chaleur combine,so as you see David it is enough to full out hair ;-) So i try just to follow the cook books and place the cakes on the second bottom rack or just in the middle,but I guess it is just try,try,and then in my case try again. Terrific blog as always, David – merci mille fois. The salade dilemma is most easily resolved by simply saying salade verte (if you don’t want Nicoise, Parisienne, etc.). Shouldn’t be difficult for English speakers to remember, since the term “green salad” is very common in English. What is the difference (or is there one?) between a flan/far and a clafouti? I was taught that most baked things go in the center of the oven unless the recipe specifies otherwise. Placing them higher will brown the top more. i guess the flour also goes on step 2, correct David? Karen: Far is denser, usually because it has more flour than clafoutis. 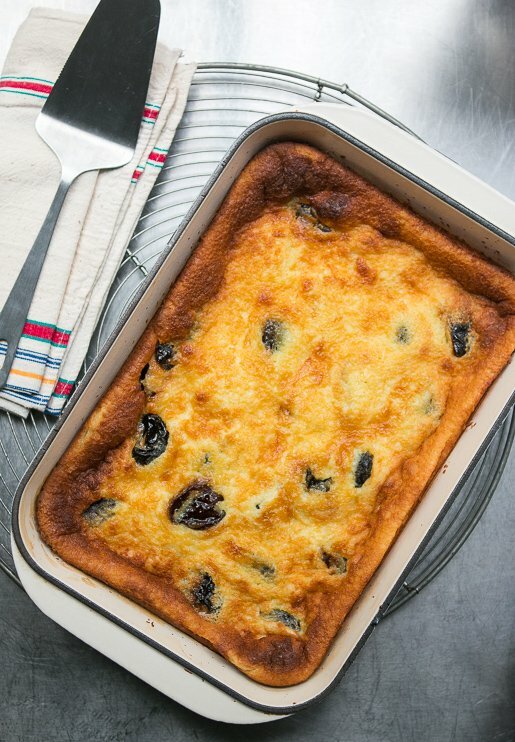 Also a clafoutis is generally made with cherries, not prunes, although it’s become more common to make it with other fresh fruits. claudia: It’s added with the other ingredients. Leigh: Yes, salade verte are the words one should look for if one wants a great salad. I think the confusion is because in English, we sometimes say “green salad,” or just “salad” to refer the a green salad, whereas – as you mentioned in French, it’s usually called a salade verte. WOW! You will not believe this, but I”ve been searching for a Breton far recipe for a while now. This recipe is a gift! A while back you posted a macaron recipe that has been my absolute staple. Now this! OMG. I cannot wait to make this and will attempt to do so this weekend. I miss France so much that this will sate my appetite till I return. I’m away from home with family for Thanksgiving, but I’m going to give this recipe a try as soon as I get home. One question I had is why do you not put a pan of hot water under the baking dish? I thought to be “custard” it needs to be baked above very hot water…at least, that’s been the instructions in the books I have. Normally custards need to be baked in a water bath because they are fragile and need slow cooking. But because of the flour/starch in the custard, this doesn’t require it. I’ve eaten Far Breton in Brittany and love it. 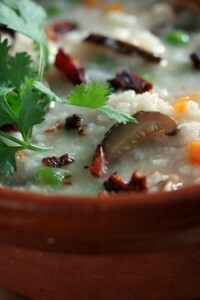 I had a regional cookbook with the correct recipe – it was loaned and never returned. So, thank you, David. The Costco size bag of prunes in my pantry is begging to be soaked in brandy and baked up like this…thank you for sharing. You have taken me back to high school French, and memories of a German class I thought to try…three genders to memorize there! Great article David! I was wondering if figs would work in the Far recipe instead of prunes. 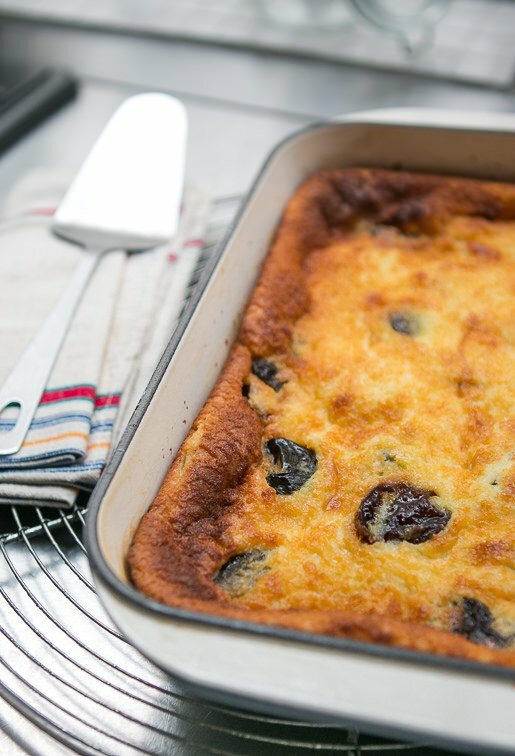 I had a cooling class in Paris a couple of years ago, and we made clafoutis with fresh figs. Would soaking them make them fall apart as they are not a dried fruit? Or should you use dried figs? I love reading your posts, your books…. You had fun with this one. 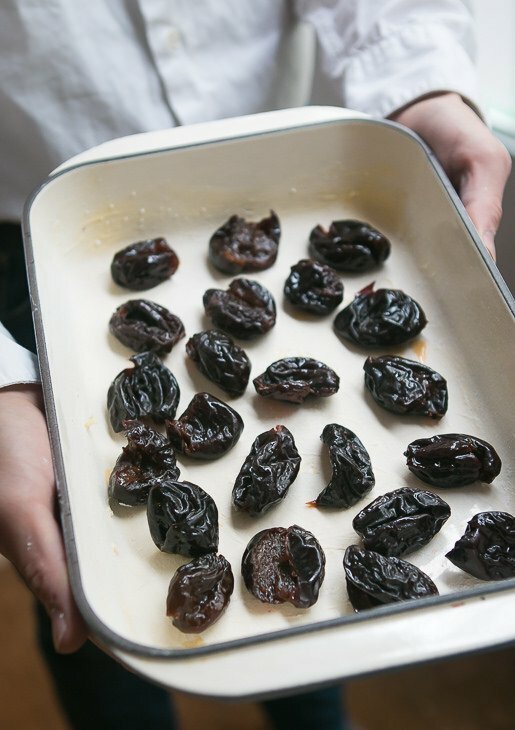 I really, really don’t like prunes – no matter what you soak them in. Could this be made with cherries or plums or apricots? If so, any advice, tips or warnings? Um, I completely relate to social media post anxiety and have the habit of visualizing an entire post, sentence by sentence, in my head directly after publishing. Once I mis-titled a recipe “Andalusian Gazpacho” when it was actually “Salmorejo Cordobes” – a much graver error than yours (plus, I think even French people struggle with French spelling hence those listening activities the petits frenchies have to do in grade school). Your photos of this french sweet treat look terrific. Bon app and happy thanksgiving! Thanks for the measurement conversions. I just got finished doing as conversion for Stargazy Pie, which, despite being the other side of the pond I intend to bake and alter as needed. Just want to be boring about the language aspect of it all. ‘Bon anniversaire’ is certainly pronounced as if ‘bon’ were ‘bonne’ (except in some parts of France) because ‘anniversaire’ begins with a vowel and the two words are pronounced together, i.e. there’s a liaison. I always like the example of ‘moyen âge’, where ‘moyen’ really is pronounced as if it were ‘moyenne’ (the feminine singular form). ‘Ma amie’ would in the past at times have been ‘m’amie’, but in all such situations, i.e. before a vowel, the masculine singular form took over. Of course, there’s ‘ma mie’ ‘my darling’ (‘my little friend’); here you might say that ‘amie’ has lost its ‘a’, but at the same time there’s a word, ‘mie’, which means ‘crumb’ and is more common as ‘miette’ and ‘mie’ (le pain de mie) (as ‘mic’ it’s Romanian for ‘little’); it’s rather nice to call someone your ‘crumb’. And I love le far breton, and le kouign amann (‘butter cake’ in Breton). This recipe looks very good. As Carla said , it is just a matter of liaison ,it is quite simple :you make the liaison when when the second word begins with a voyelle. 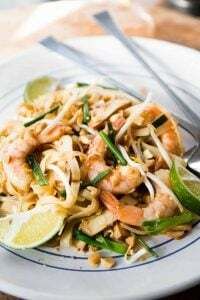 This looks delicious David – a perfect crowd pleaser! During my first trip to France in the 70s I visited a friend who was studying in Rennes and we had Far at one of our meals. I thought it was the best dessert ever, and occasionally I search for a recipe but have not found one from a trustee source..until now. I can’t wait to try it. Thanks for reviving a lovely memory. 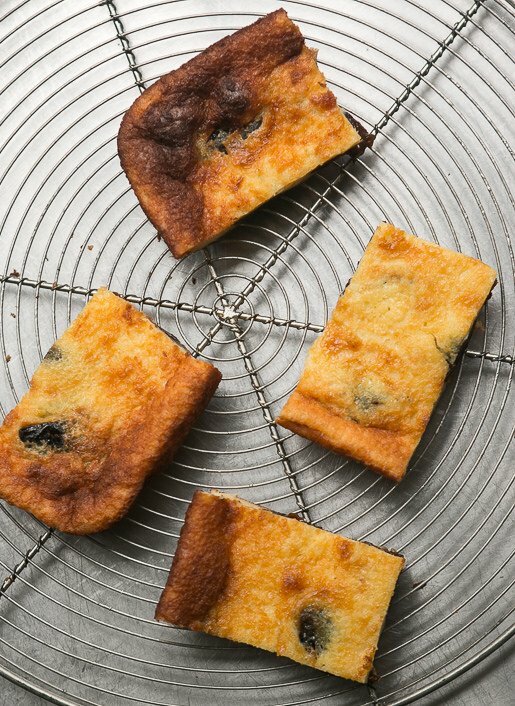 The culinary High Priest Richard Olney wrote–in one of his books–that a clafouti uses fresh fruits and that a flaugnarde uses dried fruits, but they are otherwise identical. Both use a crepe batter, which can be thick or thin depending on you preference. Since flaugnarde and flan appear similar, it’s probable one is related to the other. David–I came across your sight several weeks ago and I love it. I was a chef many years ago and lived in France for a few months. After reading your #11 in Comments Policy I knew you had to be a chef. So refreshingly direct. Is it possible to use ginger wine or ginger liqueur in this? how about marsala? Far Breton – one of my all-time faves! 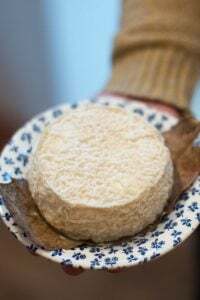 We were travelling through Brittany this fall and had many fine Far Bretons. Sometimes we were served this for breakfast, sometimes we bought a slice at the local markets, homemade by a vendor, and always found great ones in the patisseries. One day we missed lunch due to a delay and stopped in a small village on our journey and bought a thick slab of the best ever Far Breton – it was packed solid with prunes. I agree with you, the prunes are what makes this dish, and would never think to substitute them. Haven’t come across far breton before, but prunes and armagnac are a marriage made in heaven (and they make the most delicious ice-cream, which I must make again soon). I could see doing this in a pastry crust. Your salad description reminds me of my year in France. Towards the end, my friends and I decided to diet a bit before heading to the beaches of Europe. The Restau U lunch staff was incredulous to our request for only salad and not the hot, main course. “Que de la salade?” they would repeat over and over as we went through the line with our trays. Your post also reminds me of the craziness of learning German while just finally understanding the nuances of French grammar. The neutral gender and dativ tense were enough to put me over the edge! I often make clafoutis but look forward to trying a far. Thank you! I’ve never see a far that looks as yummy as this one! If i still remember my french lesson from long time ago, the ‘bon anniversaire’ casse-tête has a technical term: dénasalisation – all that to make it sound more joli! How is Armagnac different than cognac? Is it a major taste difference and worth seeking it out? I cannot wait to make this! In no way, shape or form would I think of substituting raisins for the prunes (my oatmeal raisin cookies actually have prunes in them instead of raisins). Also, since the liquor of choice has accents of prune in it, OMG! What a combination. Thanks for sharing. I too have often been confused as to whether it is bon or bonne anniversaire. My first instinct would have been bonne and I’m sure I’ve sent birthday wishes as such, but anniversaire is masculine, so ‘bon’ is the correct and it is likely that damn liaison issue. FYI: I checked the Google ngram viewer for the French literature indexed by Google Books (https://books.google.com/ngrams) and ‘bonne anniversaire’ doesn’t show up. ( will try yours now) this and your previous market post were really speaking to me. That is where I tasted my first Far Breton! A happy American Thanksgiving Day to you. Thank you for your blog — it makes a crazy world more civilized and much more edible. Je te remercie pour tout ton travail. That flan (or far) looks delicious, by the way! Hello David! I’m a big fan of your blog and have been following it for a while. However I never baked anything until right now. I have the batter for Far Breton resting in the fridge at the moment and wondering if it’s going to separate overnight. Should I pour it as is into the baking dish or mix it up before that? Many thanks for your advice! Hello David,once again another wonderful entry. It is reassuring to read about your French faux pas as each day I am trying to “get it right” when I speak , and feel success will never happen. Your Paris market post was just delicious, I live near Orléans and just love our Friday afternoon market. At the moment the stall that sells only apples and pears has some fabulous varieties I have never seen before. 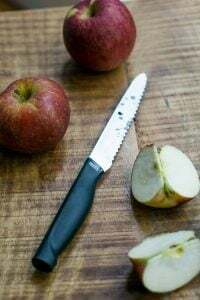 If you get the chance hunt up Géromine apples ,which are ruby red and so delicious and Louise Bonne pears also a treat. I think they may be older varieties . Thank you again for your continued inspiration. Liza: Leave it in the bowl and pour it over the fruit (as shown in the post) before baking. You may want to give it a few stirs before you do. Allison: Armagnac is made from different grapes than Cognac (and is a bit stronger), and Cognac is double-distilled as well. 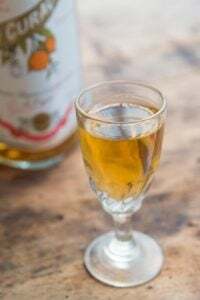 Armagnac is the traditional liquor to use, but Cognac will work. Katia: You could certainly plump the prunes in another liquor of your choice. Dennis: Thanks for the clarification from Richard Olney. And yup on #11! hummm… en fait, on écrit “c’est plus joli” car l’adjectif “joli” se rapporte au pronom “c’ ” (diminutif de ceci, neutre) et non à “expression”… mais ce far est très joli et très appétissant! It always pleases me to hear of your flea market shopping. Recycling at its very best. I enjoyed checking out the “fleas” at Bastille and Aligre in September, but would not have been able to bring home any cast iron pans. Enjoyed seeing all the glorious food and flowers. you had me literally screaming silently with joy and laughter – you outdid yourself with this post! I can’t tell you how much pleasure I derived from your experiences with language, customs, cookery, and once you just learned that a ‘liaison’ in a sentence doesn’t REALLY mean anything on How to WRITE that same sentence, you’ve got sussed it pretty much out. And anyway, anybody commenting unfavourable on your French, should instead simply congratulate you to your fantastic English! You employ such a richness and colours in your posts that I am hooked from the first to last sentence, photos, tips. Thank you – I also learned something about the word ‘flan’ – and although I never made the Far Breton myself, I might well start now, knowing HOW EASY it is. Just as long as I can keep that Armanac over the plums and not in my glass! Only hope not to have referred to same things that were ment. In the 51 comments before mine. Don’t have time to read them NOW but I will…. Another joyful moment coming up! And, would you believe it, I just had a completely unexpected invitation in my letter box for a Thanksgiving Meal with the American/Swiss couple upstairs…….. Must dash! But I much prefered the alternate version she did which was using no pruneau but grand marnier instead (and yes we were still kids at that time but a little bit older). just enough to get the taste of orange. out of the fridge this one was my very best pastry ever. try this version sometime.serve it cold during summer it’s a winner. David, I just wanted to say that Far Breton came out delicious! We enjoyed it with a glass of light sherry. Many thanks! Simply delicious. I saw this dessert in the Pastry Shop last night. Made this on Thanksgiving Day. Didn’t have a 10 inch pan so I pulled out ancient cast iron rounder from my Grandma. Worked out great! Fire going, football on the tv, heavy rain and wind outside (Pacific Northwest island) great smells! great taste! Nice presentation. Had a slice of Far Breton in Chartres a couple of weeks ago and was in heaven. Great coincidence that you posted this now. You are hilarious. I’ve been trying to master french for over 10 years and you have described perfectly why it’s been impossible. The Far Breton was delicious & so easy to make. Thanks for providing your recipes in metric as I usually don’t bother with recipes that specify sticks of butter or x ozs for instance. 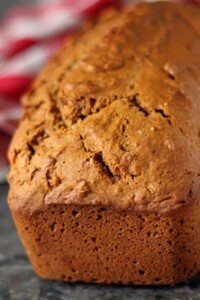 I like & use your recipes because you’ve tested them properly and hence no disasters for home bakers. David, although I haven’t yet compared recipes, this looks and sounds like a version of clafouti, n’est-ce pas? i made this recently with apples, but found it lacking a little–not sure why. i love this type of dessert, actually breakfast for me, with coffee..
I’ll definitely have to try this recipe when I get home to NY because it looks delicious…but I just wanted to say I know exactly how you feel about the masculine and feminine forms! I’m here in Paris for the year (a dream come true!) and trying to master the French language but I feel like a few hundred years ago some guy just arbitrarily gave words genders. Anyway I love your blog and your Instagram and I will try to make it to your booksigning today because I’m a huge fan!! My husband sus an “etage” in París and stayed with dime friends who live very close to a Poliane bakery and flan was his absolute favorite Evert time we go back to París our friends greet us with flan From Poliane. I’m going to make this for him right Now, thanks David!! The most delicious flan parisien is found technically not in Paris, but in le Kremlin-Bicêtre at the Boulangerie la Kremlinoise (20 rue du Général Leclerc, just off Porte d’Italie). It’s called petit flan de Martha, and is not dense and overly sweet, like most flans pâtissiers are. The crust is flaky, buttery and crispy, and the custard is light and has a nice vanilla flavor. Try it. Really. It’s worth a few steps beyond the périph’. Call it a flan or a far, crème renversée or crème caramel, I can’t warm up to these eggy, custardy desserts. But thanks for reminding me how good prunes can be after a soak in Armagnac. I’ll takes those eggs, make a nice custard base and freeze it as ice cream — adding those wonderful prunes and a little extra Armagnac. Now that’s a dessert! how would a clafouti be different from this?